At last year’s Golden Globes Awards, guests wore black to honor the Time’s Up movement focusing on gender and racial inequality in the entertainment industry. This year, Lady Gaga’s scene-stealing, voluminous, periwinkle Valentino ballgown celebrated the return of color to the Red Carpet, and visible support of the protest was limited to black and white bracelets. 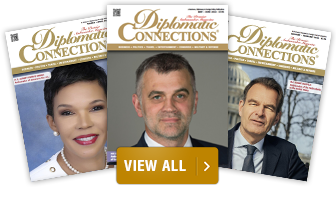 There was also not much issue-related speech-making, compared to last year - although Glenn Close’s tearful comment on the importance of women striving for “personal fulfillment” received a standing ovation. Overall, the 76th Golden Globe Awards evening – opening salvo of Hollywood’s awards season – was less rambunctious than usual. The fact that alcohol is served, and the atmosphere is relaxed and convivial to a greater extent than the more solemn Oscars has in the past produced - a carefree climate has provided a platform for the respective hosts to be rather spontaneous with the jokes. This year’s ceremony was delightfully calm and composed. Where British comedian Ricky Gervais, when he hosted the evening, spewed insults like pellets from a shotgun, presenters Sandra Oh – herself nominated for her role in Killing Eve – and Andy Samberg of Brooklyn Nine-Nine were gracious and dignified. Sandra Oh even expressed her host humor with a bit of diplomatic regard when she gave a shout out to her parents in Japanese, bowing respectfully, hands clasped in front of her. Her parents bowed back with joy. Civility ruled the night and it was a pleasure to be a spectator. Even so, this year’s Golden Globes Awards still managed to maintain its reputation as an evening of surprises. The 90 or so members of the Hollywood Foreign Press, whose show this is, stunned the audience by choosing Bohemian Rhapsody as the winner of the dramatic motion picture category, beating out A Star is Born, the very strong favorite, and then stretched credulity ever farther by naming Green Book best motion picture, musical or comedy. The former, a Freddy Mercury biopic had not been well received by critics; as for Green Book, the Wall Street Journal called it “a movie, that’s not a musical, not a comedy and not the best of anything.” The ebullient Olivia Colman, also British, for her role in The Favorite, and Glenn Close in The Wife. Still, despite being seen as more cheerful than credible, Golden Globe awards are often a good forecast of which nominees will go on to win Oscars, pinnacle accolade of the 9,000-member Academy of Motion Picture Arts and Sciences. 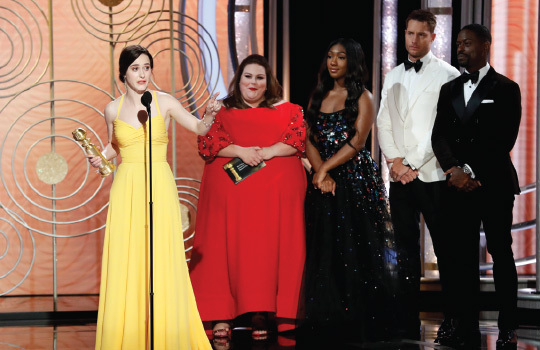 But the Golden Globes lead a double life: unlike the Oscars, awards are also given for TV as well as the movies, which increasingly makes sense as the lines between the two mediums blur, and some noteworthy films premier on streaming platforms. In his acceptance speech, Michael Douglas, who won for his lead role in a television comedy for The Kominsky Method – a Netflix production - said the rise of streaming media had lured big-screen stars like himself, “has made television much more acceptable.” Without commercials, he said, “it’s as close as you can get to a short film.” Another major movie star, Julia Roberts, was nominated for her first foray into television in Amazon’s The Homecoming, but lost to Sandra Oh (Killing Eve). In the fashion line-up Roberts was one of the few who wore black even though that theme was primarily for last year. 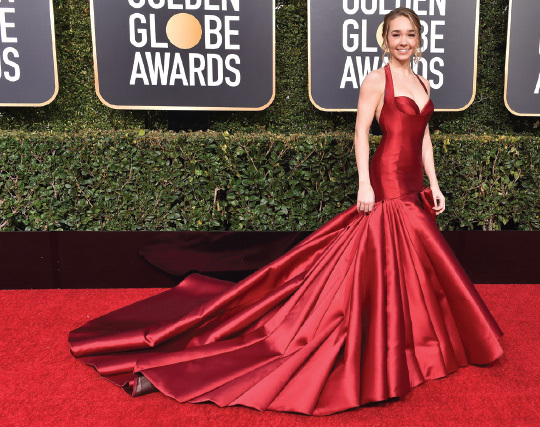 Otherwise, as if to contrast 2018, white and red were the two biggest colors of the night - Sandra Oh in a red Versace tuxedo dress, Julianne Moore in Givenchy, Crazy Rich Asians star Constance Wu in Vera Wang, to say nothing of Jamie Lee Curtis, and Dakota Fanning. The next most visible color was green, as worn by Catherine Zeta-Jones, Michelle Yeoh, and others. Some male guests also preened a little – well, a lot, actually. Spike Lee wore purple, Bradley Cooper was pristine in all-white, Billy Porter swished his bejeweled Randi Rahm cape to show the pink silk lining to photographers. Without question the biggest loser was A Star is Born despite its multiple nominations and favorable press. But also without question, Bradley Cooper’s movie lives to fight another day. A Star is Born may not have been considered anything special by the voting journalists of the filmdom’s Foreign Press Association, but there are more than enough Motion Picture Academy members who still subscribe to the old Hollywood belief that if a film is worth making, it’s worth making again. And this is the fourth re-make of A Star is Born. 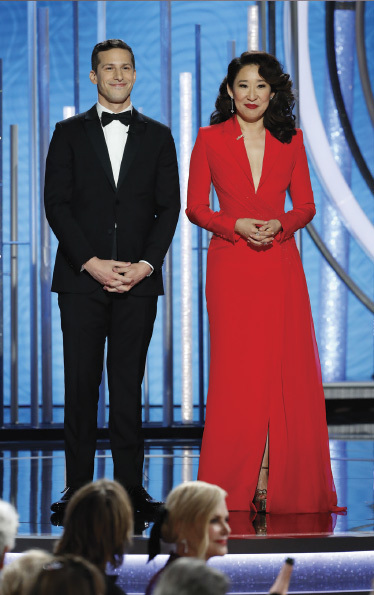 Hosts Andy Samberg and Sandra Oh speak onstage during the 76th Annual Golden Globe Awards in Beverly Hills, California.